kept reinventing itself in prose, film, and finally as an audio drama. 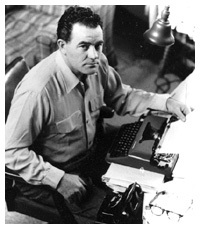 Sometime in the late 1940s or early 1950s Louis L'Amour pounded out a short story that he titled "The Diamond of Jeru." It was twenty pages written, no doubt, in just a couple of days ... Louis was trying to sell a story a week at that time and to keep up that pace he had to come up with a vastly greater number of story concepts (often over 80 a year). As was usual for him there was no rewriting; a story either "took" or it didn't. Sometimes he might only get a few pages before realizing that it wasn't the right idea or he wasn't sure how to resolve the story. If he succeeded in finishing and it seemed good he would try to publish it, if it didn't he stashed it away and kept going, pursuing new and better material. He never made an attempt to sell The Diamond of Jeru. The story went into a pile which later went into a box ... a box that was filled with unpublished stories and was left in the back of a closet to be discovered forty years later in the months following his death. Most of those stories were eventually published during the 1990s ... but The Diamond of Jeru was almost not one of them. Many of the works published after Louis's death needed a bit of editing, some took substantial cuts and then bits of transitional writing to bridge the gaps, others needed more ... a more focused ending or better character development. I found all of these jobs fun though it was occasionally difficult work. I like to approach editing and rewriting with as light a hand as I can get away with ... it is best that no one know where the cut or change was made. Whenever I could work it out, the solution strayed as little as possible from Louis's original work ... the minimum to allow it to become what it needed to be. In most of the stories even I can no longer find the places where the various changes were made. With the short story The Diamond of Jeru the term minimum didn't really apply. Not only did the story need a lot of rewriting but the whole collection of Off the Mangrove Coast needed to be many pages longer in order to justify publishing it. The Diamond of Jeru needed to become a novella. To read Louis's original, unedited and unrevised, short story of The Diamond of Jeru CLICK HERE. Luckily, the potential seemed to be there. 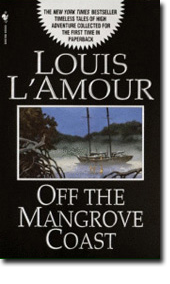 There were aspects of the first several pages that reminded me of the work of Somerset Maugham, who had written about the Malaya at the time Louis was sailing those same waters. Louis visited Borneo in the 1920s and had obviously drawn inspiration from the days he spent there ... the story seemed to have a lot of potential though I wasn't quite sure how it would all play out at the time. I started writing, creating a similar but more realistic plot, using the same basic characters but trying to make them more complex and human. One of the problems that I had was I knew almost nothing about Borneo and had little time before the book's deadline to do research. As luck would have it, I ran across several wonderful books. A Stranger in the Forest by Eric Hansen is the account of the author's journey from one side of the island and back, on foot, mostly alone. It is filled with wonderful detail and absolutely saved my bacon over and over. 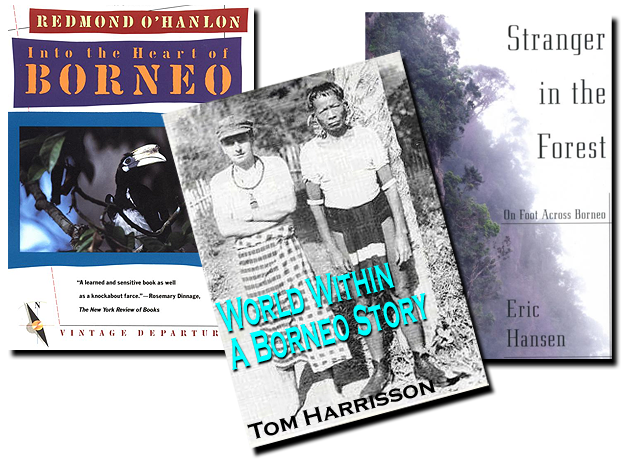 Together with Redmond O'Hanlon's, Into the Heart of Borneo and the classic The World Within by Tom Harrisson I had the backbone of a library on the world's third largest island. Most of the information on diamonds, I have to admit was learned from the wonderful novels by Wilbur Smith as I couldn't find a non fiction source for much of what I needed to know. So I was off and running. Our editor kept calling, "Where's the book? Deadlines! Deadlines!" I kept telling him, "They're still going up river, you have to give me more time!" Finally, it was done and off to the printer. My experience with diamonds, the tribes of Sarawak, Jeru, Mike Kardec, and John and Helen Lacklan was over ... or so I thought.